Fly from London Heathrow or Manchester. Sous Sdei and welcome to Siem Reap, Cambodia! Siem Reap is the gateway to the ancient and magnificent Temples of Angkor. From the 9th to the 13th centuries Siem Reap was the capital of the powerful Khmer Empire which left the legacy of the Angkor Temples. You will be met by an Emerald Waterways representative and transferred to your hotel. This evening join your Tour Director and fellow travellers for a welcome dinner. Discover More: Uncover the outer lying temples, either Banteay Srei or Beng Mealea, or explore the Roluos temple group (additional cost). Start the day at the magnificent and famous Angkor Wat. The temple is known for its elaborate decorations and intricate carvings throughout. It is a masterpiece to behold and will leave you breathless. Continue to the unique Ta Prohm temple which is overgrown by jungle trees. In the afternoon, visit Angkor Thom through the ancient South Gate which is lined with carvings. Continue to the impressive Bayon Temple, containing 54 towers each with four faces. Finish at the Terrace of the Elephants and the Terrace of the Leper King known for their intricate bas-reliefs. EmeraldPLUS: This evening witness the incredible Phare Cambodian Circus. Phare is an NGO founded by Cambodian refugees to assist disadvantaged young people by teaching them performing arts. The show is a spectacle of acrobatics, theatre and music themed around contemporary Cambodian life and society. This morning is free for you to do some last minute sightseeing or shopping. You will be transferred from Siem Reap, through the scenic countryside to the quaint town of Kampong Cham on the Mekong River. 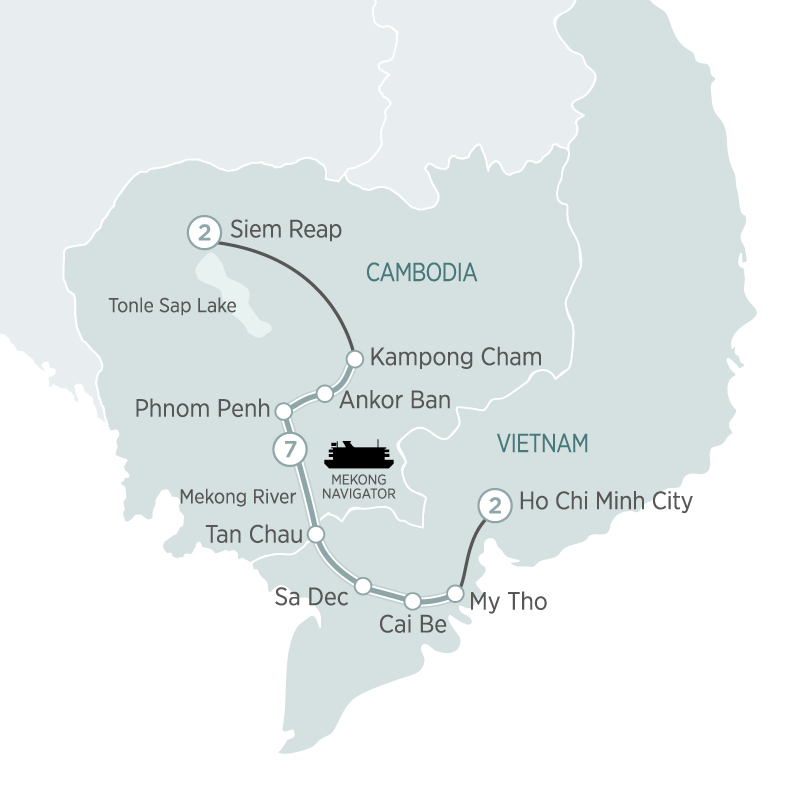 From here we will begin our journey downstream aboard the luxurious RV Mekong Navigator. Once on board you will meet your Cruise Director and receive a warm greeting from the crew, followed by a welcome reception. This evening enjoy a delicious Royal Cambodian Theme Dinner. Make our way to Wat Hanchey, an ancient hilltop pagoda which is the home to Buddhist Monks and offers some of the best views of the Mekong River. EmeraldPLUS: Receive a traditional Buddhist Water Blessing from the monastery’s resident monks. After enjoying a walk around the monastery and the amazing views of the Mekong River valley, we descend the enormous stairway, surrounded by the incredible view of the Mekong below. Following lunch, we sail to Kampong Cham and drive through the city to visit the hills of Phnom Pros (man hill) and Phnom Srei (woman hill), the incredible Stupa, the 10-metre long reclining Buddha, and the 13-metre tall preaching Buddha. We then visit the 12th century, Angkorian-period complex of Wat Nokor Bachey, which features several original statues of Buddha and stone inscriptions. Today we have a great opportunity to get to know traditional life in the Mekong with a visit to the charming town of Angkor Ban. Here, you will have a glimpse into the lives of the local people starting with a visit to a family’s home to see how the locals live, along with an opportunity to meet the family and discuss their lifestyle. Continue through the village to the local school where you will join the children in their classroom and experience what a typical school day is like. Then walk back through the village to the ship, including a brief stop at the local monastery complex. This morning we learn about the darkest days of Cambodian history. A short drive will take us to the Killing Fields at Choeung Ek which is a disconcerting reminder of the recent atrocities committed by the Khmer Rouge regime. We have the opportunity to walk through the fields, visit the small museum and Memorial Stupa, and learn about this sad history. We continue to what is possibly the most powerful museum experience in Indochina, Tuol Sleng Genocide Museum (also known as S-21). This is a former school that was converted to the main prison and torture headquarters of the Khmer Rouge and is a chilling reminder of the brutal history. The afternoon is at leisure to explore Phnom Penh. Go shopping at the local markets, or simply relax at one of the many restaurants and pubs such as the famous Foreign Correspondents Club. Cambodia’s capital Phnom Penh was once known as the “Pearl of Asia”, but it was almost entirely evacuated by the Khmer Rouge in 1975. Today it is an inspiring and buzzing centre of hope and opportunity with plenty to see and do. EmeraldPLUS: After breakfast, we meet our cyclo drivers for an exciting morning city tour of Phnom Penh. Cyclos, a Phnom Penh institution are three wheeled bicycles built for transporting passengers. They are a traditional mode of transport throughout the Mekong and provide a unique view of the capital. Prepare for a leisurely journey as we are taken along the riverfront to the magnificent Royal Palace complex which is a highlight of any visit to Phnom Penh. Enjoy a leisurely walk through the grounds, viewing Throne Hall and Moonlight Pavilion before visiting the famous Silver Pagoda, home of Cambodia’s Emerald Buddha and Maitreya Buddha, encrusted with more than 9,000 diamonds. The cyclos then transport us to the National Museum, ending the morning with a comprehensive tour of the many Angkorian and pre-Angkorian artifacts discovered in the Angkor Archeological Area in Siem Reap. Our afternoon is again at leisure. EmeraldPLUS: Before dinner, visit the Sun Deck to enjoy a cultural performance by the Cambodian Children’s Group. The performance includes Apsara, Cambodia’s national dance as well as local traditional folk dances. Cruise toward the border. Following clearing formalities and crossing the border, we witness a fascinating change in the architecture along the riverfront as we sail into Vietnam. Xin Chao and welcome to Vietnam! After lunch, enjoy a visit to the local island village of Long Khanh A (Hong Ngu). Long Khanh A produces a large number of traditional, Khmer scarves which are exported to Cambodia and here we will have the opportunity to see the weaving process take place in homes around the village. Interact with the locals, some of whom are embroidery artists, displaying their art in and around their homes. Finish with a visit to the local temple dedicated to a unique religion founded in this area of Vietnam, Hoa Hao. This evening join the culinary team on board and watch them demonstrate the art of Vietnamese and Cambodian cooking. Upon arrival to the historic town of Sa Dec, we visit the home of Mr. Huynh Thuy Le, who inspired Marguerite Duras’ novel, L’Amant (The Lover), and take a fascinating walk through the town’s market experiencing the local sights and sounds. We board traditional sampans to navigate the narrow canals of the Mekong, where we can observe daily routines of the villagers en route to the town of Cai Be. Along the way, we stop at a local brick factory to view the complete process of brick-making by local men and women utilizing clay from the Mekong. Afterwards we return to the ship for a sumptuous lunch and enjoy a scenic cruise downstream. Following lunch we reboard our sampans and sail through Cai Be’s floating market, a fascinating and iconic scene of the Mekong Delta. Watch as the locals trade and barter a variety of wares and exchange goods across the river. Sail past the city’s attractive French gothic cathedral, then tour the historic Anh Kiet House with its beautiful surrounding gardens. Visit a traditional rice factory where workers produce rice paper, rice wine, popped rice, and many varieties of traditional candies. We then return to the ship and gather for a farewell reception and Vietnamese “Mekong Delta” Theme Dinner as we prepare for our journey to Ho Chi Minh City. Following breakfast we disembark and bid farewell to the RV Mekong Navigator and her crew. Transfer from the busy port town of My Tho to Ho Chi Minh City. More commonly known as Saigon, this is a city with a turbulent and colourful past, although today it is the country’s commercial centre with over eight million inhabitants and four million motorbikes. This afternoon be guided on a city tour of Saigon, visit Reunification Palace where Saigon fell, then stroll to the major sights such as the Old Saigon Post Office, bustling Dong Khoi Street, Opera House and City Hall. Finish at the War Remnants Museum which provides a graphic insight into both the wars in Vietnam. EmeraldPLUS: Travel to the infamous Cu Chi Tunnels. An ingenious network of over 200km of underground tunnels, they were built by the Viet Cong guerrillas as a means of protection, communication and deception. Join a Vietnamese Veteran and learn of the wars, strategies, atrocities and the resourcefulness of the Vietnamese which eventually led to the defeat of their enemies. Hear fascinating stories from first-hand experience to allow a real insight into one of the most famous wars of our time. Return to Saigon and spend the afternoon exploring the city. This evening enjoy a sumptuous farewell banquet. Transfer to Ho Chi Minh City airport for your onward flight. Please note: The Mekong River is subject to extreme variations in water levels throughout the year. Every effort is made to provide the routing and inclusions stated however depending on water levels prevalent at the time of sailing, this itinerary may be amended or modified.